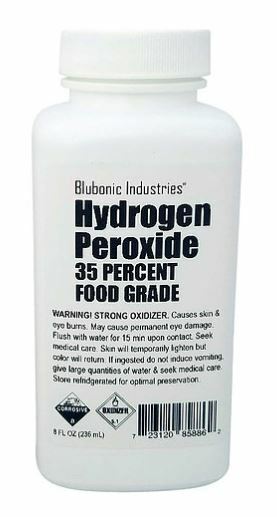 Blubonic Industries® 35% Food Grade Hydrogen Peroxide, NOTHING ADDED. Manufactured, bottled and stored under the strictest conditions. Bottles are approved, Safe-Gard tamper-evident, hermetically vacuum sealed, food grade, and compatible with food grade hydrogen peroxide. Hydrogen Peroxide (H2o2) is the most effective natural oxidizer, bleaching agent, disinfectant, and the only germicidal agent composed of only water and oxygen. It kills disease organisms by oxidation, and for this reason is considered the most effective natural sanitizer known to science. Food grade refers to the standard of handling and quality in the Food Chemical Codex. Purity: Manufactured and tested by a Stanford U chemist using computer controlled titration to ensure precise accuracy in concentration, within 1/1000 of 1%. This item contains the highest concentration level permitted and recommended for handling, with great care. 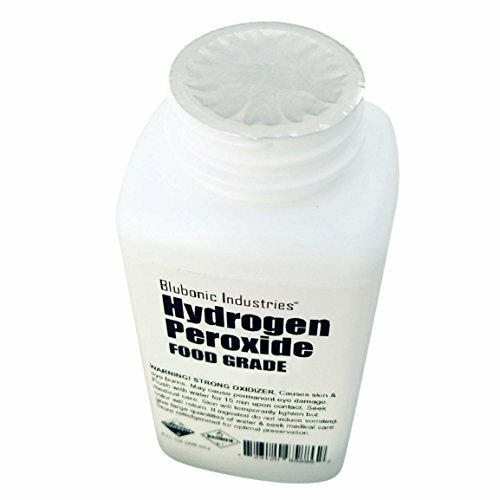 To ensure exceptional freshness the hydrogen peroxide is shipped hermetically sealed within 5 days of manufacturing. Storage: For optimal preservation, product should be refrigerated or stored in the freezer. Kept in refrigerated conditions, the reduction in concentration is 1-2% per year; Unrefrigerated about 10% per year. When storing unused for greater than one month, it is advisable to either release air every 30 days, or simply don’t twist cap airtight, as pressure will build over time. Usage: raw ingredient used in a wide spectrum of applications so we don’t offer usage expertise. We do include some basic handling, precautionary, and dilution information with product.